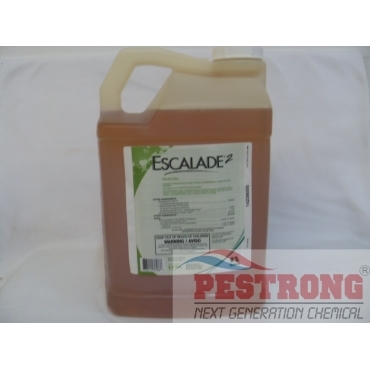 Where to Buy Escalade 2 Herbicide, Escalade 2 Herbicide for Turf E-2 - 2.5 Gal - $227.95 for Sale with Fast Free Shipping! Escalade 2 Herbicide for Turf - 2.5 Gal is a premium combination herbicide that uses the advanced new fluroxypyr active to quickly control a comprehensive spectrum of broadleaf weeds in turfgrass. Also an innovative formulation, Escalade 2 will eradicate most broadleaf weeds from turfgrass and provides unsurpassed control of clover. Offers the power of 3 proven herbicides - fluroxypyr, dicamba and 2,4-D. Effectively controls more then 100 broadleaf weeds, including dandelion, plantain, oxalis, chickweed and many other hard to control species. Labeled for ornamental, turf, sod farm, non-turf area include woody plants. Good three way with fluroxypyr broadleaf herbicide!